As soon as you file for Chapter 13 bankruptcy, federal bankruptcy law immediately protects you with an “automatic stay.” This stay halts any collection efforts -- including litigation or foreclosure -- from all of your creditors. Since the stay is automatic, it applies to everyone who files, and the bankruptcy court simply issues an order to put the stay in place. 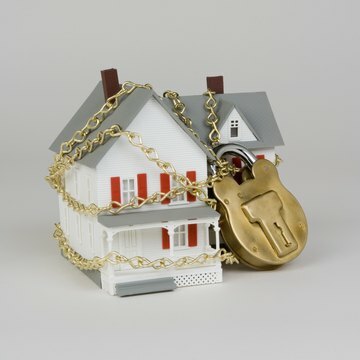 Even if you are in the advanced stages of foreclosure and an auction date is set for your house to be sold, the automatic stay stops the proceedings. Chapter 13 bankruptcy restructures your debt under a repayment plan that typically last from three to five years. You submit a repayment plan to the court for approval, and it must include your mortgage arrears along with your other debts. During the life of your plan, you must pay your disposable income to a court-appointed bankruptcy trustee who will redistribute that money to your creditors as provided in your plan. If you want to keep your house, you must stay current with the repayment plan in addition to paying your ongoing mortgage payments. If you miss payments on your repayment plan or don’t stay current with your ongoing mortgage payments, your lender can file a motion for relief with your bankruptcy court, asking the court to lift the automatic stay so the lender can foreclose on your home. The lender can file this motion at any time once you get behind on your repayment plan or ongoing payments. If your mortgage lender files a motion for relief, you will have an opportunity to oppose the motion in a hearing before a bankruptcy court judge. If you don’t oppose your lender’s motion, the court likely will lift your stay so your lender can proceed with foreclosure. If you oppose the motion, the court might issue an "adequate protection order" to give you another chance to catch up on missed payments, or it may decide the issues at the hearing. An APO eliminates the need for a hearing by allowing the lender to proceed with foreclosure or other remedies -- but only if you do not get current on payments and fees. Bankruptcy Law Network: What Is an Adequate Protection Order?